Over the years, I’ve learned that – contrary to popular opinion – the bigger the vision, the easier it is to reach that vision, and, ultimately, the size of your vision should be determined by the size of God. How many people could be reached here? When determining the size of your vision, you need to keep three factors in mind. The first factor is the ultimate population of your ministry area. Obviously, if a church planter is going to start a new church, he doesn’t plan a church of 2,000 in a town that only has 500 people in it. Be pragmatic. How long are you willing to stay? Most of us overestimate what we can do in one year and underestimate what we can do in 10 years or 20 years. The trouble with most goal setting is we set our goals too low and try to accomplish them too soon. Instead, we need to set big goals, huge goals, enormous goals, but plan on plenty of time in getting there. I tell everyone who comes on staff with us, “We don’t expect a miracle overnight. Let’s build.” We’re not interested in building a mushroom. We’re interested in building an oak tree. A mushroom takes 12 hours to grow; an oak tree takes 60 years. But an oak tree is going to last. To reach big goals, you have to plan for the long haul in ministry. There are lots of flash-in-the-pan churches. There are churches that have grown larger than our church in a shorter amount of time. There was a church once near Saddleback Church that started with 1,200 people within the first month, but a year later the church was dead. It didn’t build the structure. It didn’t build the roots. It didn’t build all the other factors. Everything rises or falls on leadership. So how long will you stay there? If you don’t plan on staying someplace for the long haul, don’t go there. You must plan for time. Persistence is the key in reaching a large goal. Conversely, the size of your goal will be determined by how much of your life you plan to spend in reaching it. The third factor for determining the size of your vision is a frank appraisal of your own gifts. The Bible clearly teaches that there are one-talent people and five-talent people and 10-talent people. Some pastors will never have more than 150 in their church because they insist on doing everything themselves. They do all the prayers, all the visitation, all the counseling, all the marrying and burying. They want to know everybody by name. This shepherd-type of pastor loves the personal contact of getting involved with people in that area. There’s nothing wrong with having a shepherd’s heart. God loves people with shepherd’s hearts. That’s why he made so many of them. There are about 400,000 churches in America and maybe 95 percent of them run less than 300 on a weekend. Most of those are led by pastors who have a shepherd’s heart. But if your church is going to grow, you must be willing to raise up other leaders and other shepherds, too — it’s one of the prices of growth. In other words, you’ll have people who do not come to you, personally, for counseling. They won’t come to you for weddings. They won’t come to you for funerals. The same thing is going to be true of your area. If you have a vision to grow a large church that reaches people from across the spectrum, you’ll have to change the way you think. That’s why you have to do an honest assessment of your gifts. So how many people are reachable where God has called you to serve? How long are you willing to stay? And how has God gifted you? 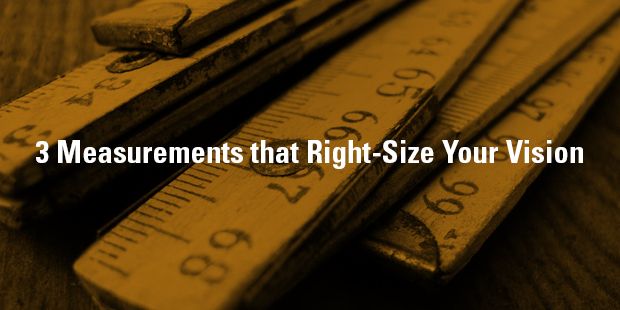 What is the right-size of your vision? Connect with an Auxano Navigator to talk about your vision.